Amphibian Auto UHU made by Lehmann,Germany.EPL # 555. 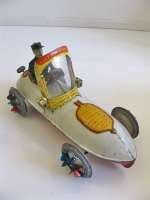 Amphibian car UHU made by Lehmann, Brandenburg between 1907 and 1938. Lithographed and hand painted tin. Wind up. Working fine and in a good condition.L=9 1/2 inch - 24 cm. Literatur­: Heike Köhler und Katharina Kreschel:Vom Störischer Esel zum Kletteraffen Tom.Brandenburger Museumshefte 6, Brandenburg an der Havel 2007. Jürgen & Marianne Clieslik: ­Ein Jahrhundert Blechspielzeug, München 1981. Helmut Schwarz und Marion Faber:Bewegte Zeiten/Moving Times-Ernst Paul Lehmann Patentwerk.Geschichte einer Spielwarenfabrik/History on a Toy Factory, Hrsg.Museen der Stadt Nürnberg 2003. Tuck Comb Wooden Dollhouse Lady .Circa 1825. 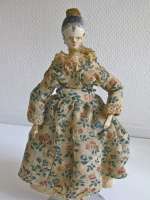 A charming and rare peg wooden lady doll with a Tuck-comb circa 1825. This 8-3/4” / 22 cm. This Peg-Wooden doll from Grödnertal, Germany is all-original, fully jointed and in good condition with normal wear to gesso due to age. ( This is stabilized). Her head & torso are connected. 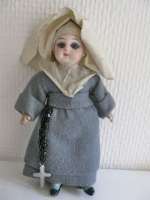 She has a with hand-painted face, lovely painted hair in two shades and rings at the ears to fasten earrings. She has orange painted slippers..Jointed at shoulders, elbows, knees and hips Dressed in her all original clothing a dress made of thin wool muslin, a underskirt and pantalons as well as chemise. 8 3/4" 22 cm She is in good condition considering her age. Would be lovely in a large scale early dollhouse. Celluloidpuppe "Bärbel von Schildkröt ca 1940. 38 cm tall is this lovely nostalgic German celluloid girl from ca 1940 made by Schildkröt Germany. 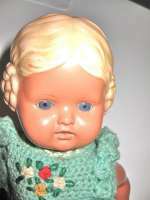 She has the remarkble hairstyle and inset blue glass eyes, open/closed mouth. Excellent condition. Very little wear to hair. She comes with her wardrobe. 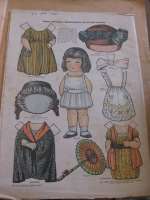 4 dresses, hats and trousers. A lovely typical girl from the 40-ties with this very desirable hairstyle. Touring car no.50 made by Georges Carette,Germany. Lithographed touring car no. 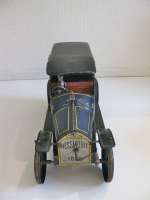 50 made by Georges Carette,Nürnberg about 1910.The car has rubber tyres on the spoke wheels. Clockwork. Working perfect. Four hand painted figures. The car is in a very good condition. 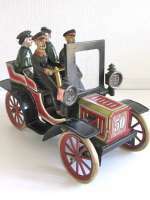 The figures have some wear.L= 8,7 inch-22 cm.See Peter Ottenheimer,Toy Autos 1890-1939,London 1987. Car # 1024 made by Hess,Germany. Car with flywheel mechanism made by Matthias Hess,Nürnberg around 1920. The car has no. 1024.Driver. Rear doors to open. Working perfect. Very good condition.L= 9 1/2 inch- 24 cm.Literature:See Peter Ottrenheimer,Toy Autos,1899-1939,London 1987. 13 different sheets of Paper dolls from the 20-ties. Here we have 13 different sheets of magazine paperdolls from the 20-ties. They are all from Danish Papers and uncut. NOTE: The price is for one sheet. These paperdolls are really nice. The Scandinavian Kings as Paper dolls. King Haakon from Norway, King Gustaf from Sweden and King Christian from Denmark. Magazine Dolls. Original. Marked 1918. Excellent original condition. NOTE: The price is for ONE sheet.